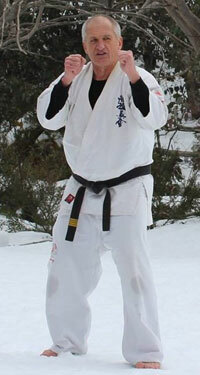 Our enthusiastic team of instructors is headed by Sensei Geoff Miller: a 4th Dan black belt with over 30 Years experience in Kyokushin karate, including a significant tournament career, he brings vast experience and a wealth of knowledge to the Alpine Dojo. We all look forward to training with him. He is joined by Sensei Sue Texler: a 3rd Dan black belt with 20 years of Kyokushin karate training, and the first student to train from beginner to black belt at the Alpine Dojo. Her passion for ‘all things karate’ plus a love of teaching, give Alpine Dojo students every opportunity to reach their potential. History was created on 24/11/18 when Natalie Texler gained her 1st Dan Black Belt during the National Camp at AIS Canberra. As a black belt, Natalie joins her mother Sensei Sue, and her sister Anneliese Knight, who gained her belt in 2013. 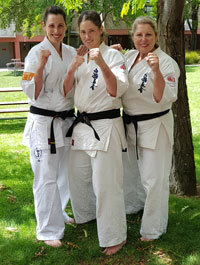 This is the first time a mother and 2 daughters have all achieved black belts in Kyokushin throughout Australia.